In Collateral Damage, you take the role of a gang boss trying to take over Neo Japan. You command a group of typical characters from romantic comedy anime. You can direct them to battle it out in a city, but watch out! Characters can fall in love, and may then ignore your orders and instead follow their love across the board, battling it out for their love’s affection. The first player to control a majority of Neo Japan, despite the complexities of love, wins! 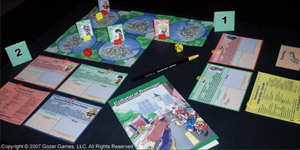 Collateral Damage: The Anime Board Game is the only anime board game currently on the market. It is an exciting new board game for 2-6 players ages 13 and up. A game runs about 2 hours, and knowledge of anime is not necessary to play, but it can make the game more enjoyable. Want to know more about how the game is played? Check out this 4 page manga (2.5 Mb PDF) explaining the rules, and the Visual Quick Start Guide to get started. Previous Previous post: One week left!